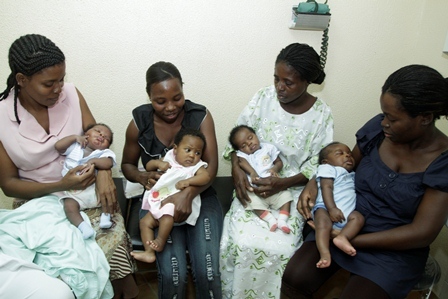 Group of moms and babies at clinic in Luanda. Join the Angola Field Group on Thursday, February 23, for “Sickle Cell Disease: The Silent Killer of Angola Children”, presented by Dr. Patrick McGann, a pediatric hematologist who is conducting research here in Luanda at the Pediatric Hospital. 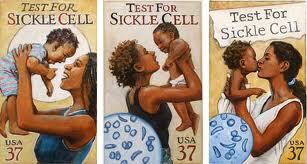 Sickle cell disease is an inherited blood disorder that effects 2% of Angolan children. All of these children are likely to die before age 5. An innovative program in Luanda over the past 6 months is focused on the screening and treatment with newborns with sickle cell anemia to provide basic interventions that will improve the survival of children with sickle cell diseases. This presentation will provide an overview of sickle cell anemia and how the program’s efforts in Angola are likely to significantly reduce childhood mortality in Angola. Taking blood to be tested. Photos courtesy P.McGann. Dr. McGann is a pediatric hematologist at Baylor College of Medicine and Texas Children’s Hospita who is working in Angola on an innovative newborn screening program for sickle cell anemia, which is an invisible killer of many Angolan children. Before moving to Baylor, he attended Tufts University School of Medicine and completed his pediatric residency at Massachusetts General Hospital in Boston. He did his hematology/oncology training at St. Jude Children’s Research Hospital and has recently moved to Houston to work on this program, led by his mentor and worldwide sickle cell expert, Dr. Russell Ware. In addition to monthly trips to Luanda during the beginning of this project, he will move to Luanda in July/August of 2012 to further develop the program in Luanda and throughout the country. Everybody is welcome to attend the presentation which will be in English. In close cooperation with the Viking Club, this event is offered free of charge. Alcoholic and non-alcoholic beverages and snacks are sold at the bar, coupons must be purchased. The Viking Bar opens at 7:30 PM. If you would like to have a map showing the location of the Club, click here to view our Join Us page. The Viking Club is on the main floor of Predio Maianaga, Rua Marien N”Guabi, No 118, across the street from the new Panela de Barra restaurant.